New Orleans is an excellent place for a weekend getaway. Create the perfect 3-day itinerary and head to the Big Easy. Travelers on a budget can save on hotel rates by making their “weekend” in the middle of the week or two days and one weekend night. The following guide can help in planning where to stay, where to eat, and what to do for a three-day stay in New Orleans. Choosing accommodations in the French Quarter means being within walking distance of New Orleans top things to do. It’s an easy walk to Bourbon Street, Jackson Square, and dozens of bars and restaurants making it easier to do more in a short time. It’s also convenient for streetcar rides. The Le Meridien in the Central Business District is an attractive choice for accommodations, as it’s located next to the French Quarter. For those planning on spending most of the time on Bourbon Street, there are some charming boutique hotels on Royal Street or Chartres Street. Of course, there are accommodations right on Bourbon Street for those who don’t mind the noise. A trip to New Orleans wouldn’t be complete without hitting a few nightspots on Bourbon Street. Bar hop for a few specialty drinks or settle into one place and do some people watching. 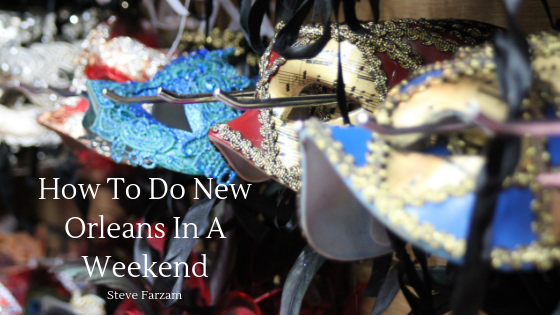 For a bit of a tamer time, consider a night out on Frenchman Street. It’s the best place in town for enjoying New Orlean’s live jazz. New Orleans has much more to offer than bars. Book a tour while in town. One of the best to take is the Cemetery Tour. Something is charming and fascinating about cemeteries like the St. Louis Cemetery No. 1 in this city. Another cool thing to do is have a reading done by a medium like Cari Roy at Muriel’s in Jackson Square, the most haunted place in town. Outdoor lovers will want to spend some quiet time kayaking. Take one of the kayaking tours with a guide to learn the area’s history at the same time. Another fun outdoor option is a steamboat ride down the Mighty Mississippi. The Steamboat Natchez has several different two-hour cruises. Cafe du Monde is famous for their fresh beignets and signature coffee with chicory. It’s located at 800 Decatur St.
Royal House Oyster Bar is known for their oysters Rockefeller, oysters on the half shell, crawfish etouffee, and shrimp & grits. It’s in the French Quarter at 441 Royal St.
Tableau restaurant is a great choice for brunch. Try their eggs benedict with a New Orleans twist and $15 endless mimosas. Find it in the French Quarter at 616 St Peter St.